When you live in a small town, and you want things to happen, sometimes you have to make them happen yourself. On Friday, I'll be reading some poems as the opening act for two amazing young musicians from Brooklyn. We'll be performing in a backyard a few blocks from where I live. 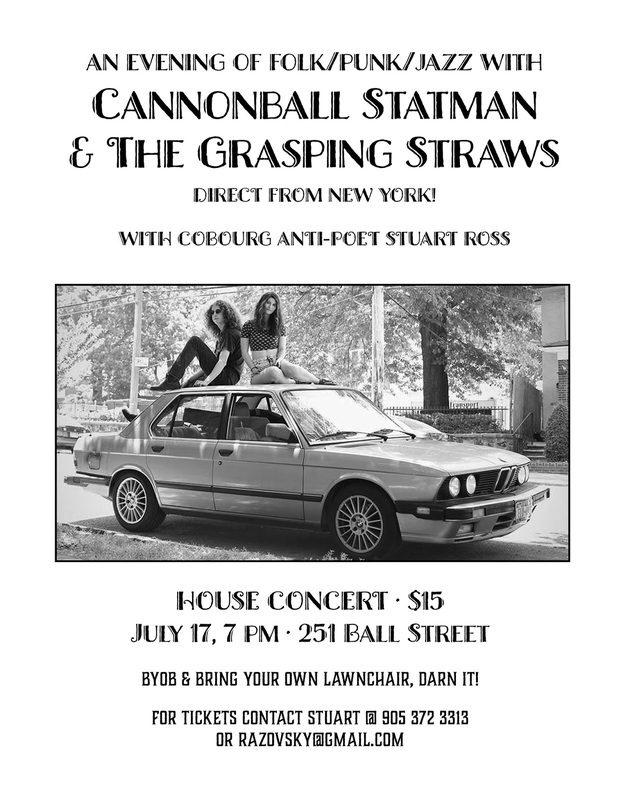 When I heard that Cannonball Statman and Mallory Feuer were touring the U.S. and bits of Canada, I offered to set up a backyard concert for them here. My friend Mark Donnan agreed to provide the yard and to co-organize the event. I became aware of Cannonball through his mother's postings on Facebook. I loved his thrash-folk approach. Reminded me a lot of Brenda Kahn, whose Goldfish Don't Talk Back is an anti-folk classic. Cannonball's mom is Katherine Koch, the daughter of the late Kenneth Koch, one of my favourite American poets. Kenneth was a poet/novelist/playwright; Katherine is a painter and memoirist; Cannonball's dad, Mark Statman, is a poet; Cannonball is a songwriter/musician. What an amazing lineage. 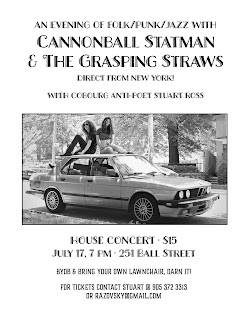 Through Cannonball I became familiar with the music of Mallory Feuer, singer and guitarist for the Grasping Straws (though she's performing solo on this tour). She also dips her toes into folk, but with jazz and soul influences as well. And lots of thrashing. Fantastic songwriter and singer. I'm going to read a few new poems to kick the evening off. If I can manage it, I'm going to steal a song title from each of the artists and use it as a title for a new poem, something I did when I shared a stage with a couple of folk acts at the Hillside Festival in Guelph a bunch of years back. Either way, I sure am looking forward to meeting Cannonball and Mallory and seeing them perform live. Cobourg is only 75 minutes by car from Toronto, 90 minutes from Kingston, 40 minutes from Peterborough. So come on down for some down-home thrashmusic and thrashpoems. March 1 Poetry Boot Camp in Toronto!